Photo put up by PM Lee. Yes, I got pretty angry on so many levels when I read the latest outrageous attempt by our PM LHL and ESM Goh with reference to the 2015 Laneway Festival at the Meadow at Gardens by the Bay. I find it deeply offensive that our public servants, paid enormous salaries out of our taxes, should criticise their employers ( that’s you and me) in this manner. They are public servants. They owe us their livelihood. Goh went as far as calling us monkeys, which carries racist overtones. Of course the real instance of “monkey see monkey do”, to borrow that horribly offensive and demeaning phrase, is that Goh was just seeing his master spouting off and copying him. 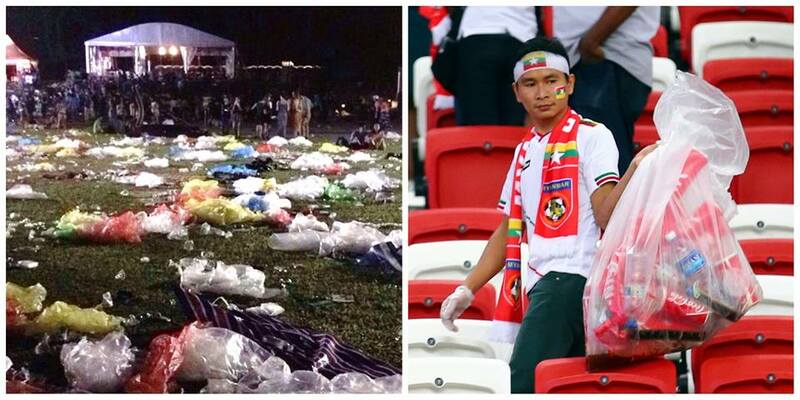 PM Lee kicked it off by posting a picture on his Facebook page showing the litter which he said, “13,000 festival goers left behind” He contrasted this with what he said were the actions of the Myanmar sports fans in picking up litter at the National Stadium after their team lost to Singapore last November. He put up two pictures to illustrate his point, one of the litter and another picture which supposedly showed a Myanmar fan picking up litter after his team’s game. Offensive because Lee, who never had a real job in his life and has always been in the public sector and has never travelled on public transport, actually thinks he can talk down to us as though he were our parent and we the stupid children. I can tell you now that a father shaming his child into good behaviour by comparing him unfavourably to his peers ( “You are disgusting, why can’t you be more like Winston?” ) is an emotionally abusive father and storing up self esteem issues for his child in later life. However take a closer look at the picture ( top of page) that LHL posted up as supposedly a Myanmar fan. I believe the picture shows a paid stadium cleaner (whether from Myanmar or not) since the person is wearing latex gloves and clutching a huge garbage bag. I’ve never seen a fan go to a match wearing disposable latex gloves and I’ve been to some pretty rough games. That would be more American psycho than American soccer. Is Lee Hsien Loong trying to pull the wool over our eyes? Level 3: Only Blaming Singaporean festival goers. His vitriol is clearly aimed at Singaporeans despite the fact that the Laneway music festival was largely attended by expats and foreign talent. The PM should get his facts right before he opens his mouth. How could he make such a basic mistake and wrongly blame us? In any case Singapore is more than 50% non-Singaporean already. Why are we to blame for the mess? I suppose the tickets to have been about S$150 each. Does he think the average Singaporean youngster can afford that? Level 4: Not blaming the organisers. If you hold an event in Hong Lim Park, say a protest about CPF and you make a public nuisance then you can get arrested. You may even be fined so much that you are banned from being eligible to stand for election to public office. As we have established that it most likely wasn’t ordinary Singaporeans responsible who should have taken the garbage out? NEA would surely fine you for littering anywhere else. I did a bit of research into the background of the Laneway music festival and the venue. Laneway music festival is a private, for-profit business that organises rock festivals in several Australian and North American cities besides Singapore. They sold out all the 13,000 tickets for the event at Gardens by the Bay. The ticket price is S$160 for one and S$150 in bundles. As all 13,000 tickets sold here, that would mean the organisers earned gross revenues of several million from ticket sales, merchandising and F&B sales. 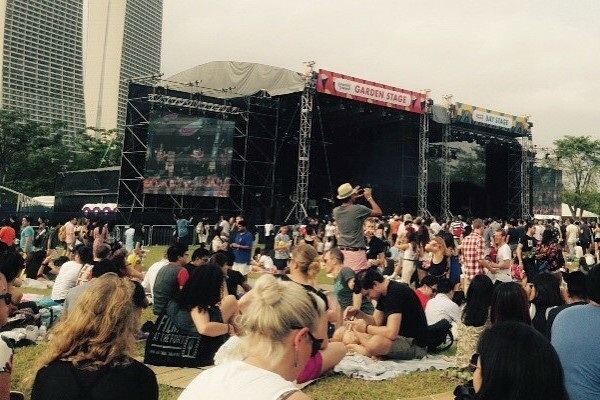 The venue was rented from Gardens By The Bay, which is a charity set up by the Government. Why were the Laneway Festival organisers not required under the terms of their contract with Gardens By The Bay to pay for the clean-up afterwards? They made a tidy profit, no pun intended so could afford a small army of cleaners. Can you imagine any other public amenity being rented out to a foreign corporate to make a huge profit with no responsibility for upkeep, damage or litter ? The photo of the mess and especially the discarded plastic looks like a public nuisance to me. If we citizens hire a venue for a birthday party we have to clean it up before handing it back, unless cleaning is included in the venue hire fee. We certainly don’t put up on Facebook the next day that our guests were disgusting. Right now Laneway should be getting hit with a penalty for not cleaning up. Or maybe Laneway were not required to clean up. Maybe Gardens By The Bay, management team forgot to stipulate that or maybe they themselves are responsible for cleaning. Maybe they thought the rubbish from 13,000 party goers would dissolve into thin air. So who is this incompetent team that manages Gardens By The Bay. The directors are mostly civil servants including the CEO of the People’s Association and an ex-NMP. In an ironic twist of fate they include the CEO of NParks. The team needs to be fired and replaced for leaving such a health hazard. Roy Ngerng and Han Hui Hui will likely be barred from running for Parliament if they are fined $2,000 for alleged public nuisance or breach of NParks regulations. If it is true that the Directors and management of Gardens By The Bay failed to organise cleaning, then they should have similar sanctions applied to them. Do the guests at the F1 night race have to pick up the rubbish? I would also be interested in looking at the accounts for the festival. Like the F1, does it result in a net loss for Singaporeans? Did the Tourist Board give Laneway the venue for free? Someone is responsible for that mess, literally. NEA should sort out who it is. Then the son and the holy Goh should apologise to us. 5: Politicking. I am angry that they both use this mess to make apolitical point. 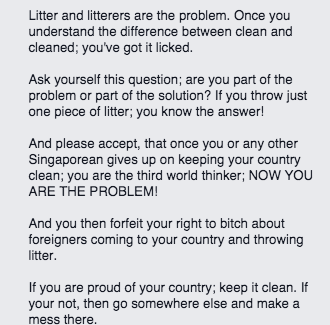 Notice how Goh warns us that we need foreigners to clean up our mess for us. It is all part of the PAP’s campaign to belittle Singaporeans compared to foreigners in an effort to foster insecurity and to keep Singaporeans distracted by anti-foreigner sentiment rather than focusing on what should be the real cause of our anger, the PAP’s policies. It is also a great big fat excuse for giving us yet another reason for why the population needs to keep increasing. It makes me furious that they are both of them leaping on any excuse to ram that message home even using false information and misleading photos. If Idid that Hri Kumar would be going berserk, calling me a liar. 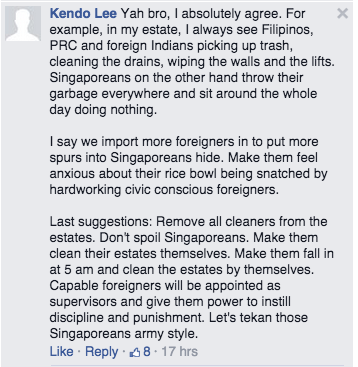 If this is about foreigners being such good cleaners then please explain those rats in our HDB blocks. Well that is just me and you will say I am biased so let’s take a look at what the netizens have been saying on LHL and Goh’s Facebook walls and give them the final word. Here is Kendo Lee agreeing that we need looser immigration policies. Here is a foreign talent Thom Bush explaining how foreigners are only dirty because locals were dirty first. He also has the audacity to tell us to go somewhere else if we cannot keep our city clean. Excellent article. Yes it rightly pointed out that the responsibility of education and enforcement rest with the organisers too; besides the relevant authorities. It would be interesting to check who are the profiteers. And is this how our leaders should act? Where is the graceful society that we all aspire to be? Please lead by example. It is true the organisers should have encouraged through announcements to ask the concert goers to dispose their rubbish correctly. I am very sure most attendees will do it and leave less mess. This littering is indeed a case of monkey see, monkey do. But most Singaporeans don’t have it in us to carry our rubbish to a proper place of disposal – bins or no bins. We should have a week (maybe 3 days will do) of no cleaner test here (except for the cleaners to clear bins) and you can see what we are capable of. If Mr Lee does not have his government job, I am sure his calibre will get him a good CEO position, earning an equal if not higher salary. Those who think they can do better should stand for election and not put down the people who have done a decent job. Would you like to work for a thankless boss or population? The junta lord over their people and line their own pockets. Many countries would love to have a government like ours – go ask around. $150 – easy money for kids these days. I am always offended when people says that they do it because cleaning is part of the package or to provide cleaners a job. It just shows your own entitlement character. PM LHL and EMS Goh can be said to have passed some kind of judgment, relating to human habits [or characteristic flaws or weaknesses, perhaps?]. How about launching a poll, for Singaporeans’ opinion of their performance, in serving the interests of Singaporeans?